Road repair specialists Velocity put their expertise under the spotlight as they went head-to-head in the battle against potholes on the BBC’s flagship magazine programme, The One Show. Dubbed ‘Pothole Wars’, Velocity performed under the watchful eyes of an expert panel to determine the best way to tackle the potholes. The panel was headed by Keith Jones, director of the Institution of Civil Engineers, who has over 40 years’ experience of highways maintenance. He was joined by the AA’s Patrol of the Year 2017 Vince Crain and Victoria Hazael, representing Cycling UK. Three innovative processes were compared, each repairing identical defects side-by-side. Joining Velocity’s spray-injection patching technique was a thermal repair system and a process using a versatile mini-planer to quickly excavate and fill defects with hot asphalt. Velocity pioneered spray-injection patching, an innovative method for permanently repairing defects. 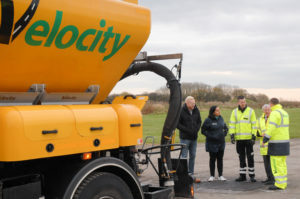 Unlike traditional techniques, Velocity’s repairs are cold-applied, spraying emulsion coated aggregate into defects at high velocity, compacting from the bottom-up creating a perfect seal with the existing surface. Each repair takes just two minutes, when it is ready for traffic immediately. The state-of-the-art machines, which are designed and manufactured by Velocity in Sunderland, are completely self-contained with a capacity to carry out up to 200 permanent repairs per day. The panel observed each process, with the judging criteria including time to perform a repair, costs, durability and smoothness of the finished surface. With each process compared side-by-side Velocity was declared the winner of the contest; the best way to fix a pothole. Velocity’s managing director, Dominic Gardner, said: “The judges were enthusiastic about the speed and cost saving of Velocity patching. “More so, they were impressed by the durability of the repair and the fact that it’s ready for traffic immediately. 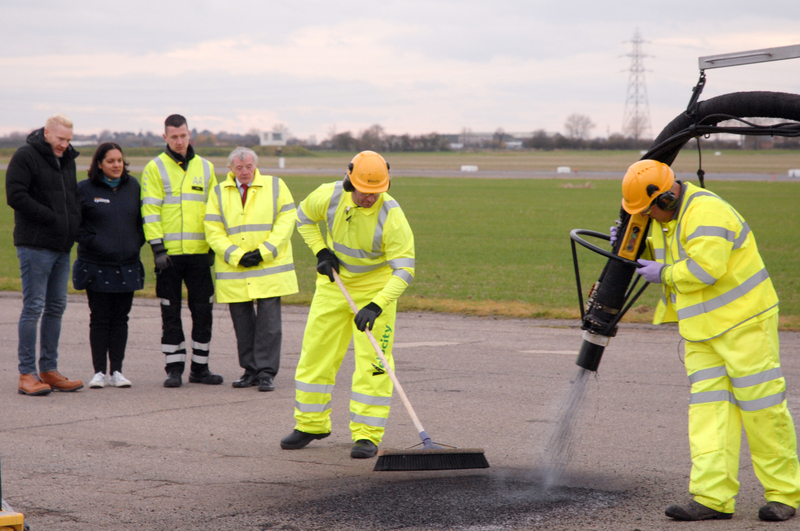 “The team are all very proud to have won the ‘Pothole War’, and grateful to the judging panel for the recognition. “Filming the feature was also a great opportunity to demonstrate the work we are doing in partnership with local authorities throughout the UK. All three processes were great examples of the innovative approaches that are used to maintain our roads and footpaths. “So far this year Velocity have completed over half-a-million repairs with our fleet of machines, bringing roads up to standard. Now in its twentieth year, Velocity is part of the Reece Group. The company designs and manufactures machines in Sunderland for export globally, as well as operating a road repair service with its own fleet in the UK.